We live in a divided world where some people buy digital and the vast majority still buy the real thing. Major publishers are seeing 24% of their global revenue stemming from eBooks and print still reigns supreme. The gap is quickly closing and many industry experts agree the total eBook market will account for $9.7 billion worldwide in 2016, more than three times the $3.2 billion in 2012. Bookstores have always played a pivotal role in book discovery and book culture in general. How will the bookstore change when digital becomes the preferred format? The quintessential bookstore has changed drastically since 300 BC when scribes would sell books directly to philosophers such as Plato and Aristotle. It also is easier to start one, then it was in France. In 1810 Napoleon created a system by which, a would-be bookseller had to apply for a license (brevet), and supply four references testifying to his morality, and four confirmations of his professional ability to perform the job. All references had to be certified by the local mayor. Bookstores large and small are hubs of social activity and drive book culture. Not only can you find a large selection of detectible delights to purchase but also meet authors and participate in discussions. It is quite common in New York for a local bookstore to organize parties or wine nights for companies such as Flickr. Book discovery is central to bookstores and they invest significant time and money into aesthetics. Barnes and Noble, Indigo and WH Smith all have it down to a science on the art of product display and maximizing space to visually draw the eye. Your average best seller shelf is filled with vibrant colors and display stands hype up other notable authors or themes. 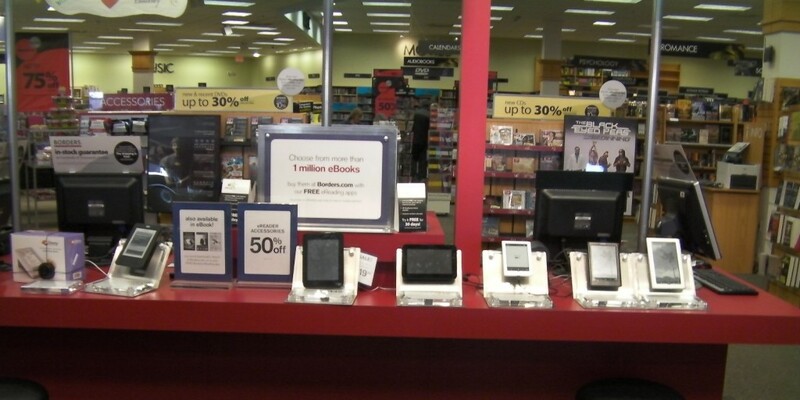 Bookstores are not positioned well to start their own online eBook system. I have heard on many occasions that for the most part, they have all lost touch with the publishers. In the past, great relationships will directly forged with the publisher and that is how the stores bought their books. Now, its all agents and sales reps, the average bookstore never even speaks with the publisher anymore. The majority of stores now deal with companies like Ingram, and rely on them for books, magazines and everything else. With no direct line of communication with the publishers, it is going to be a long-road to cultivate a relationship and get their own digital bookstore going. I agree that bookstores need to inmvolve themselves directly with digital sales but the barrier of third parties isn’t caused by distance between the bookseller & the publisher. The barrier is the inordinate cost of providing a DRm capable downloading service. The Adobe license alone costs 120k. What indie bookstores can afford that!